If you wish to redirect your customers to a webpage once they click on the Eddystone notification you need to set up a Custom URL campaign. You can do this from the beacon detail page of the beacon you wish to set this campaign on. Just login to the Beaconstac dashboard and click on the beacon you which to configure. 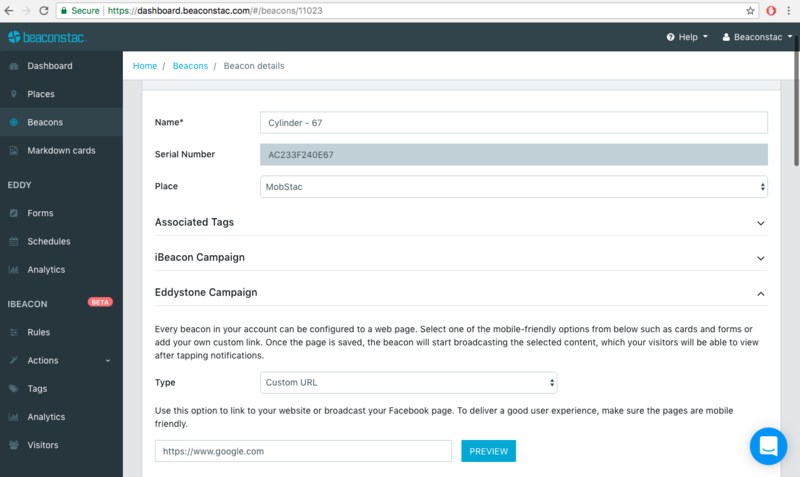 Under the Eddystone Campaign section change the Type to Custom URL using the dropdown. You then need to add the link to your website in the input box below replacing default google.com link with your desired URL. Note that your custom URL must starts with "https://"
You can also click on preview to verify if the link is working correctly. It should redirect you the website you have added.